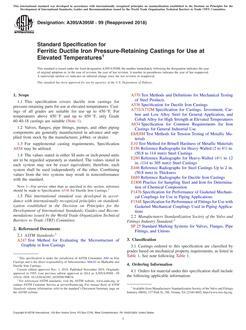 1.1 This specification covers gray iron castings intended for general engineering use where tensile strength is a major consideration. Castings are classified on the basis of the tensile strength of the iron in separately cast test bars. 1.1.1 This specification subordinates chemical composition to tensile strength. 1.2 Castings produced to this specification are graded on the basis of minimum tensile strength obtained in special test coupons designed to standardize cooling rate. The tensile strength developed in certain casting sections may vary from test coupon values (see X1.2).